The seat is compatible with many different pushchairs – see the list at the bottom of the page. A so-called SIP+ (side impact protection) has been developed by Besafe as this is the second most common source of injuries in car accidents. Obviously, the SIP+ is on the side of the seat, which is closer to the door of the car. Its function is to absorb energy by up to an additional 20% to reduce the impact of the crash on the baby’s neck and head. SIP+ makes the distance shorter between the seat and the door in order to reduce the movement – less movement is less impact on the seat and the child. The seat shell is covered with EPS and foam and soft padding to make it extremely comfortable for your baby. 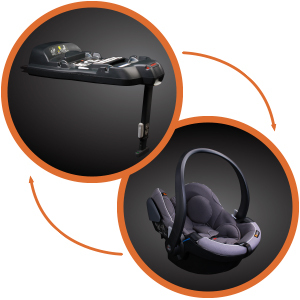 Magnets help you keep the harnesses out of the way while placing the baby. 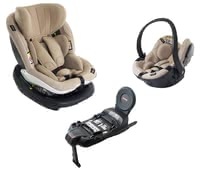 The seat has 5-point harness system for maximum safety. This stroller list is applicable for all models of BeSafe iZi Go, including BeSafe iZi Go Modular i-Size andBeSafe iZi Go X1. You can get a compatible adapter to attach the seat from the stroller manufacturer. In addition to the seat, you can also buy matching rain and seat cover and a belt collector. I hope you liked this review and if you have any question about the BeSafe iZi Go Modular i-Size with i-Size seat and base or want to leave your own personal experience, leave a comment below.